Overcast version 5.0.2 was released today, bringing additional Siri Shortcuts in iOS 12 and new Apple Watch complications to the popular third-party podcast player. The new Apple Watch complications can be located on the central or corner positions of the Infograph watch face that features on Series 4 models, offering users another way to quickly launch the app from their wrist. For fans of Siri Shortcuts, Overcast now supports three additional options. One lets you quickly enable or cancel the sleep timer, while the other two allow you to generate either standard or timestamped links for the podcast episode you're currently listening to, making for easier sharing. Elsewhere in this update, the Nitpicky Details menu includes an option to reduce the haptic level related to certain functions, and users now have more control over the Auto-Sync to Watch feature, with toggles available for playlists as well as individual episodes. Overcast is the most overrated app I’ve ever used. Overcast has gone from being buggy to being just plain broken. And with each version becoming buggier and more broken, the developer doubles down with his refusal to address his app’s major functionality issues. Normally I would move on from a garbage app, but the developer has $10 of mine, and he did not deliver a functional experience. I want my $10 back. wow my experience has been the total opposite... this has been an amazing podcast app for me. Absolutely no issues, very easy, simple and straightforward. And all the updates have made the experience more pleasing to the eyes and nice to use.... and on top of that its 100% free. Finally went Premium in Overcast. Marco added a ton of new features and this really is an amazing product version 5 and he's moving quickly to improve Apple Watch and shortcuts integration. He certainly deserves my money (even though most of us know he doesn't need it) :P Thanks Marco for the great work! Also, all of the issues I had with version 4 and CarPlay are now gone. version 5 is rock solid. I disagree about the developer. As he says himself in the app settings, he is a one person show and he is trying to have good work/family balance. He does not answer emails or generally respond to Tweets, but he is constantly updating the app. We should thank him for making the free version on on par feature-wise with the paid one (for the most part). It's a great app. Voices sound so much better. I have a hard time using the native Podcast app now. BUT, because he does work alone, the users are often beta testers in effect. If this battery drain issue is related to Overcast I can all but promise you that he will fix it quickly. I've been hearing this "reason" for a year. SO basically if you have issues with the app, too bad........he only answers select emails/tweets.... if yours isn't one of them, find another app. Nice. He likely sees them all, prioritizes the responses and responses as needed. If it is a critical bug or needs more information, he will likely respond. If you send him something he already knows about, he will likely ignore. I have sent him several tweets and emails about features and bugs. Some resolved, some are not. Such is life. Amazing app. Caring and thoughtful developer. Proud to financially support this app. If only it played video podcasts (I've given up hope). I prefer and use iCatcher on my iPhone and Watch. I bought iCatcher a few years ago, and now I beta test it too. Most weeks I get multiple beta updates to test. 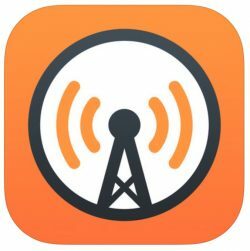 Overcast ('https://overcast.fm') version 5.0.2 was released today, bringing additional Siri Shortcuts in iOS 12 and new Apple Watch complications to the popular third-party podcast player. The new Apple Watch complications can be positioned on the central or corner positions of the Infograph watch face that features on Series 4 models, offering users another way to quickly launch the app from their wrist. There's an Accidental Tech Podcast episode the developer talked about this. I'll find it and get you a timestamp in a minute.